point, the second sparkler of the show was lit. It actually caught a Walkman lying on the stage on fire, and after a couple of seconds, the stage caught on fire. Richard successfully put the fire out after a number of kicks to the stage. The Joysticks went into a song structure as all three members began to play keyboard melodies at exactly 900.007 seconds into the show. Following this, they went back to the original dense noise structure as they went all-out for their last five minutes. Gregg and Richard both took their turns at destroying/breaking/smashing the My Little Song Maker Keyboard off the stage. The crowd, which had increased to 30+ people, began to cheer as The Joysticks went about their destruction. 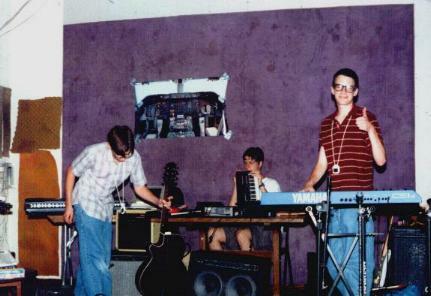 Joe triggered the demo button on the Casio SK-1 at the 20.104 minute mark, Richard said, "We're the Pittsburgh noise and fire scene," Gregg said, "Buy our stuff," and The Joysticks Battle the Clip-On Expressway to Your Skull's performance was completed. Following the show, they found support from Solex, the band members playing with Solex, and Semi. Overall, The Joysticks couldn't have been more addition-machine-like within one performance.